Original cataloging of three dimensional objects will be in accordance with the latest revision of Anglo-American Cataloguing Rules, 2nd ed., commonly known as AACR2, as interpreted by the Library of Congress rule interpretations, both of which are available online through Cataloger's Desktop. This document will highlight some key concepts found in chapter 10 of AACR2, and will provide guidance with some minor details often overlooked, or difficult to find, within the rules. The chief source of information is the object itself, together with any enclosure, label or material that accompanies it. The chief source of information is the prescribed source for the title, statement of responsibility, edition, publication distribution, etc. and series areas. Information for these areas not from the prescribed source must be enclosed in square brackets. 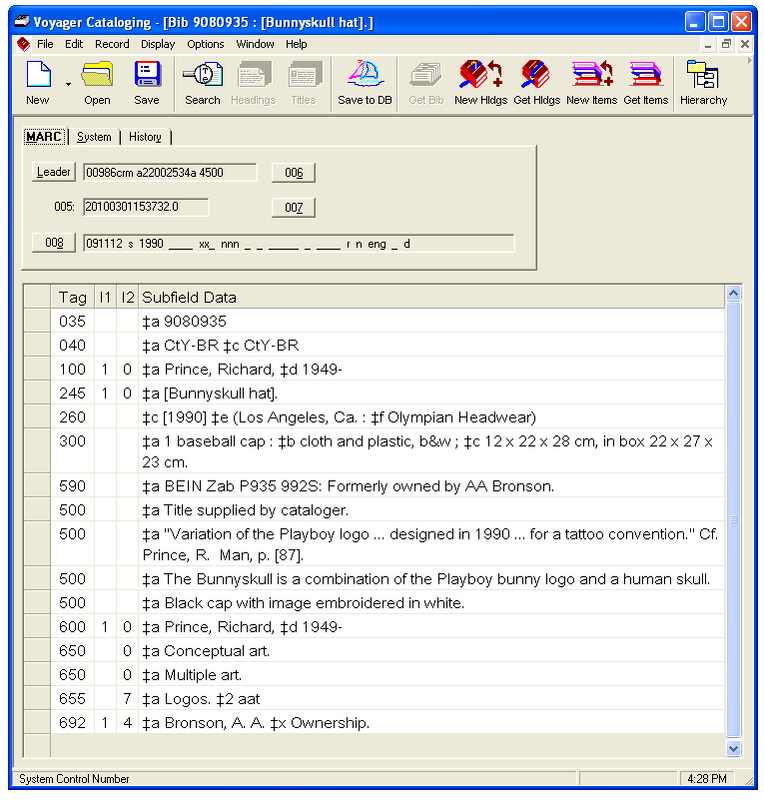 All other information used in the catalog record can come from any source. r: Three-dimensional artifact or naturally occurring object. c: Collections for collection level records. Code all other Leader values as appropriate. (projected media, two-dimensional nonprojectable graphics, and kits). will be Not applicable, None of the following, etc. (These fields are rarely used in this format. their use would be appropriate). Note: The 007 field is not used for this format. The 006 field can be used to bring out additional characteristics. 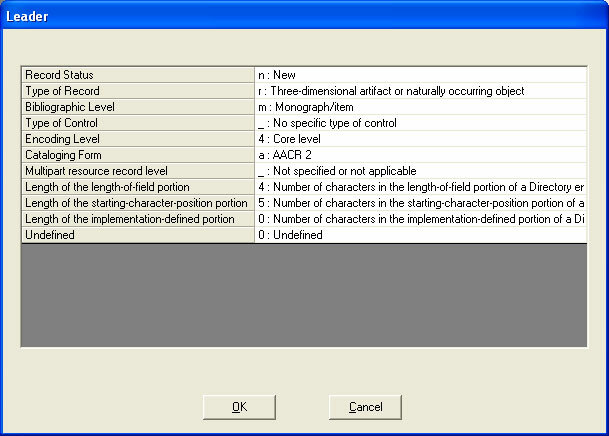 Do not use 3-D artifact in the 006, this field is for additional characteristics --the record is coded as 3-D artifact or naturally occurring object in the leader. Record the title and statement of responsibility as it appears on the item or any accompanying material. If the title appears in multiple locations, prefer the title that appears on the item. If the title appears in different forms on the item, prefer that which is most prominent. Title added entries should be made for any variation in title appearing on or with the item. Statements of responsibility are not confined to creators, they may include individuals who have collected, selected or presented the material. 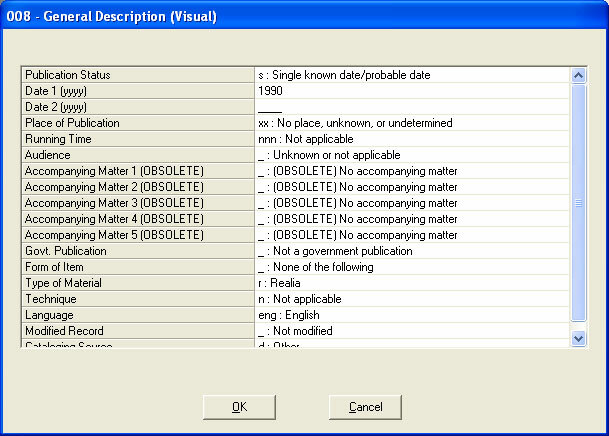 Record edition statements as they appear on published or manufactured items. The edition statement must apply all items. Record in a note, edition statements that apply to only part of what is being cataloged. Information entered in this area is dependent upon the type of material, whether it is naturally occurring, handmade, or mass-manufactured. Do no use this area for naturally occurring objects (rocks, shells, butterflies, etc.). Do not record a place of publication or publisher's name for three dimensional art originals, handmade items, or any other type of unpublished materials. Provide only a date, if possible. Any information about manufacture (including place of manufacture) will be given in a note. The creator's name can be used as the statement of responsibility (in square brackets if known but not appearing on the item or any accompanying material). Record series statements as they appear on published or manufactured items. Series statements may be traced if there is an existing series authority record coded "t" in the 645 field. Generally, do not create series authority records for items published/manufactured before 1980. As with edition statements, series statements must apply to all items. Series statements that don't apply to all items can be given in a general note. Specify the location of the title used. Provide further description of the item(s) if the information given in the physical description area is not sufficient. 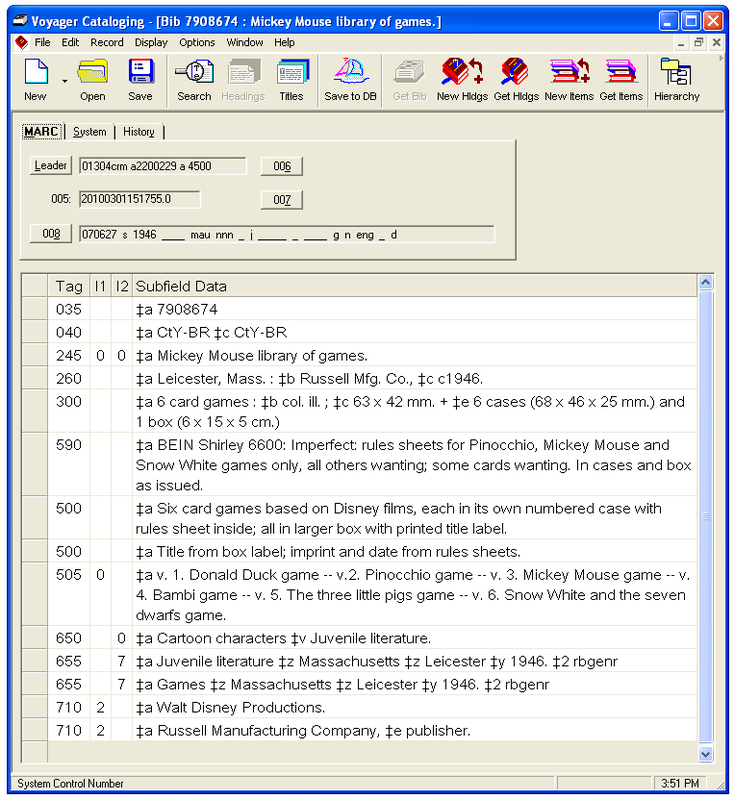 Create general notes, local notes and provenance notes/tracings as one would for monographs. Use LCSH as appropriate. Create form/genre tracings according to local policy. Additionally, form/genre terms from the TGM II and AAT can be used to bring out physical characteristics of the item(s). Create added entries for personal/corporate names, if considered important.